Hi! If you've come via the Monster RPG 2 site or wiki, then welcome! This post talks about why we supported the crowdfunding campaign. If you'd like to know more about us, then the About and Help pages are a good place to start. In short, we're independent artists who use Free Software and like to make cute stuff. A couple of months ago, I heard about a crowdfunding campaign that was attempting to raise money to support the release of a game called Monster RPG 2 under the Give It Your Own Licence Licence. My initial thoughts (which seemed echoed by several people I spoke to later) were that if somebody was excited about/committed to doing a source release of something, they'd just do it, but as I read further into what was being attempted, I could see that the campaign was less about holding the source for Monster RPG 2 for ransom, and more about trying to fund the development and permanance of support resources to empower community development and derivatives. In addition to getting Monster RPG 2's source out there, the campaign would also fund the creation of a comprehensive development wiki documenting the codebase and assets, cover hosting costs and iOS development licences, and guarantee three months worth of focused development/bugfixing at contributor request. The campaign was also intended to in part help support the development of Nooskewl's next title codenamed Baryon, but compared to how most source releases of proprietary games are handled, that's still a lot of stuff. By comparison, id Software's code dump of Doom 3 for example, was pretty much, "Here's the code, have fun!" 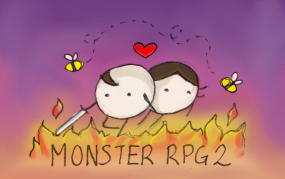 I was also keen to note that Monster RPG 2 (which I hadn't before heard of), was developed by Nooskewl (which I had), who have a history of doing source releases for their games, and this seemed like a nice opportunity to show some support. Mim and I also briefly discussed the idea of using the engine for a game of our own. In addition to throwing more money than I could reasonably afford at the time (we've bought a house and had some exciting adventures which I'll talk about in a later blog post), I also did an interview with Nooskewl's founder Trent Gamblin for my "Cheese talks to" site, and waffled on about the campaign incessently to anybody who would listen. The campaign was a success, and on the first of December, Monster RPG 2's source and assets (including some historical stuff which was pretty interesting to dig through) was made available (which worked out well for me, as a small code walkthrough made for a great LUG presentation). In addition to being able to request some large features (we've been talking about getting SVG support into the engine, which would make for nicer workflows for us if we did look at making use of the engine), the level at which we pledged also gave us some advertising space on the Monster RPG 2 site and wiki. We were pretty unsure about how we'd make use of that - neither of us particularly like the idea of advertising and prefer much more focused and interactive forms of marketing. After a lot of back and forthing, we eventually settled on putting together a quick banner ad that focused more on highlighting that we supported the project than pushing our own stuff. Monster RPG 2 itself, is a retro styled role playing game inspired by early console based RPGs (a genre often referred to as "JRPG"), and is worth checking out if you're into that sort of thing.